Apple seem to have developed a reputation for hardware that can’t be upgraded by the user, either because it’s physically impossible, it voids the warranty, or both. However I can report success with my aged white MacBook. This isn’t a “how to upgrade your Mac” article, because different models differ radically in how to upgrade: if you’re thinking of doing this, I highly recommend searching YouTube for your model and watching one of the many videos showing how to do it — that’s the best way of judging how difficult/dangerous it’s likely to be. Originally bought as a “travelling only” laptop in early 2009, when my main computer was a desktop PC, the MacBook has been my main workhorse for the last three years. I upgraded the memory to the maximum 4GB when I bought it, but it only had a 120 GB hard disk. Fast forward to mid-2013 and it is labouring along with less than 5% free disk space. Everything takes an age; new tabs in Chrome take seconds to appear, and if I want to crank up OpenOffice I might as well go and have a coffee while I wait. Even using a simple text editor, I found myself waiting for the computer to respond to key presses or mouse clicks. I dare say some people would say this computer is too old to be worth upgrading — why not just replace it? But I’m used to keeping my hardware for at least five years — in fact I still have a Dell tower PC that I bought in 1999. The only option given that it’s a laptop seemed to be upgrading to a faster, larger hard disk, possibly a solid state one (SSD). These are what Apple puts in the MacBook Air — a lot more expensive per GB than conventional disks, but much faster because they have no moving parts. I liked the sound of them, but after further research I plumped for a hybrid disk from Seagate: a 750 GB Momentus XT . The cost per GB is much less than for SSDs, but it uses a solid-state cache to achieve SSD-like performance. I’m told that as you use it, it learns which files are used most often and caches them for quick access, so it should get faster over time. 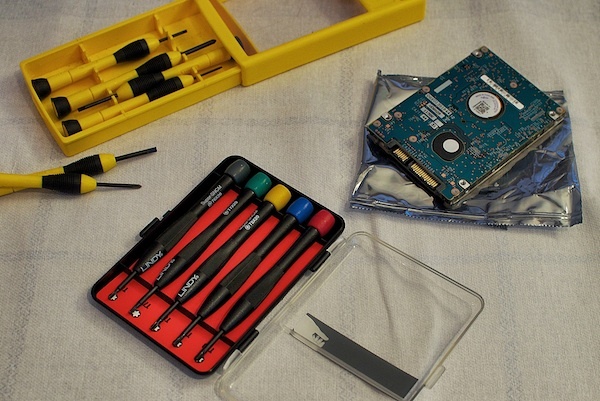 I was a bit nervous about doing open-heart surgery on the Mac, but Amazon reviews and a reassuring YouTube video convinced me to take the plunge — as well as alerting me to the fact that I needed to buy a cheap set of Torx screwdrivers . It turned out to be an easy 10-minute job; I minimised possible stress by covering my work surface with a clean cloth and laying out all my tools (two screwdrivers and a 5-cent coin) before I started. In fact it’s the easiest disk replacement I’ve ever done — once you have the battery and the protective plate out, you can just slide the old disk out using the helpfully provided tab, swap the chassis onto the new one (this is what you need the Torx screwdriver for), and then slide the new one in. What about data transfer? Also relatively painless; the night before, I used SuperDuper! to clone the hard disk onto a USB drive — a slow process that took about four hours — and then checked I could boot from the USB drive before I started the upgrade (on a Mac, holding down the alt key while booting lets you choose the boot drive). After the upgrade, I booted from the USB, formatted the new disk using Disk Utility, and cloned the old data back onto it. Holding my breath and turning my back so I didn’t have to watch, I rebooted from the new drive, and all was well! This entry was posted in Hardware, Mac. Bookmark the permalink.